Ghosts in the garden? No, row covers! Perhaps for the upcoming Harvest Festival at the Agricultural History Farm Park we should tie into another October theme and call ourselves “A Garden of Ghosts”? 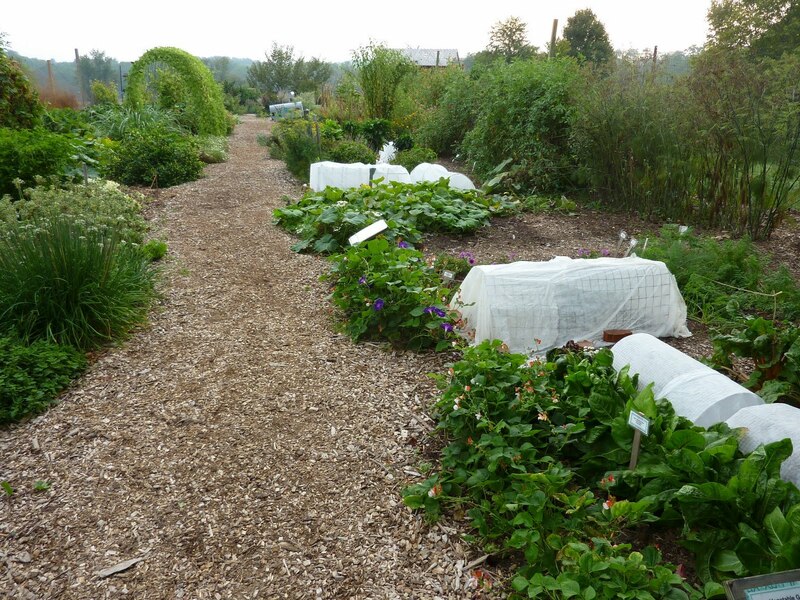 Please do visit if you are in Montgomery County on October 2 and want to tour our demo garden as well as having lots of fun around the park, but if you want to know what all the white things are, read on. Late August and early September, as the nighttime temperatures drop and the soil cools, are ideal for putting in transplants of fall plants such as broccoli, cabbage, kale, and Asian greens. The problem is, this period is also prime feeding time for harlequin bugs, as well as caterpillars that feed on Brassica family plants. One solution that does not involve spraying is to cover the transplants with floating row cover. You can simply drape the fabric over the plants, which will push it up as they grow, and hold it down on the edges with rocks, soil, or pins. 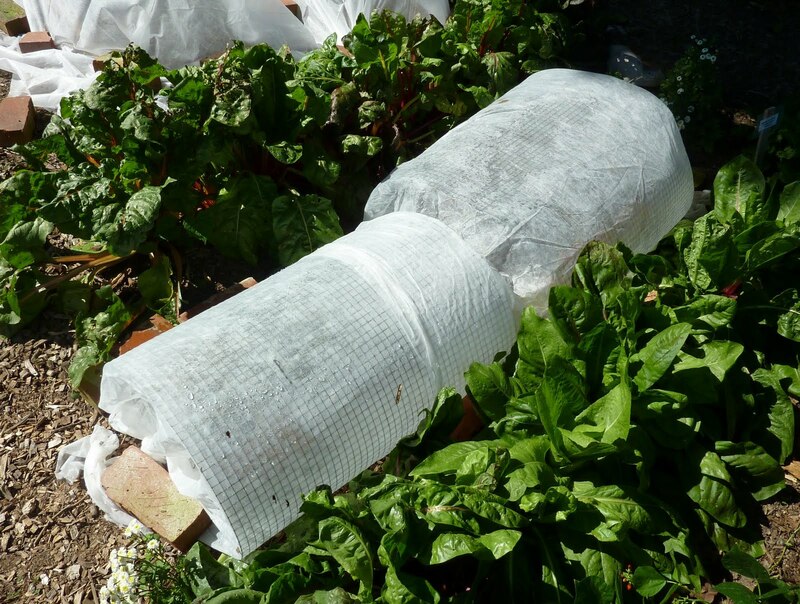 But it’s better to hold up the row cover with something that will keep the cloth taut and out of direct contact with the leaves. Next year I’ll go with 9-gauge wire bent into hoops, as recommended by Jon Traunfeld. I have been using bamboo hoops, which are nice-looking but tend to break after several uses. And we have so many short rows of fall plants going in that our remaining supply of hoops fell short. MG Barbara Dunn to the rescue! She designed a system that will work until the plants get too large (at which time we hope the harlequins will be hibernating!). 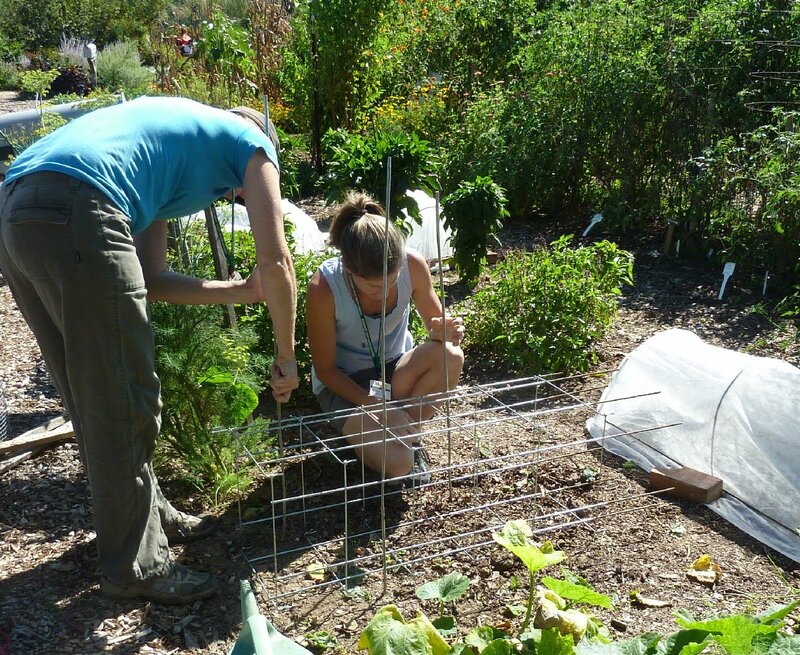 Above is row cover stretched over a hoop made of hardware cloth, which Barbara calls “the hairnet.” Below, Barbara and Margaret use a tomato cage on its side as a row cover support. These improvisations allowed us to get the plants in on time and saved me a trip to Home Depot. Last I checked the plants were still surviving under their white sheets and hadn’t become ghosts yet themselves. Light and water go through the fabric just fine – of course it would help if we had more rain!